Let’s face it. We girls require a little more maintenance that most boys. That carries over to our photo sessions as well. Whether you are scheduling your senior session, bridal session or setting up an important family session, take time to prepare for best results. 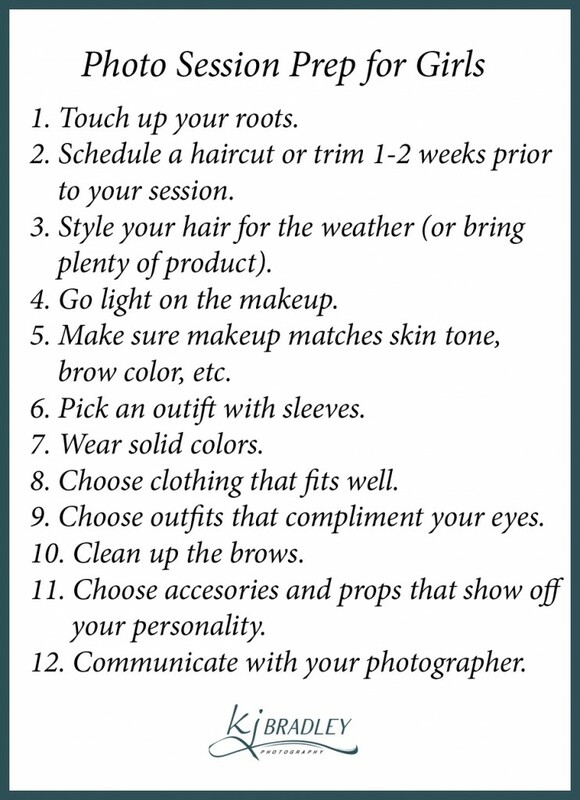 To get the most awesome images from your portrait session, use the checklist below. Is your hair colored or natural? If you color your hair be sure your portrait session date and root touch up are compatible. If you have bangs, short hair or medium hair, schedule a trim a week or two before your session. You might not want to cut your hair the day before to allow for natural growth, but you don’t want it in your eyes either. For outdoor pictures, consider the weather. If you are having pictures done in the humid summer and you know your hair curls or frizzes in humidity, plan accordingly. Straight hair will show more frizz. If you must have straight hair on a humid day be sure to bring plenty of backup hairspray and/or product to tame your gorgeous locks between setups. Less is better when it comes to makeup. 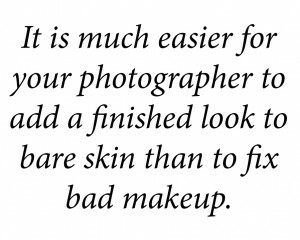 I bet you have always heard exactly the opposite, but it is much easier for your photographer to add a finished look to bare skin than to fix a bad makeup job. In fact, it is almost impossible to fix bad makeup. Makeup has reflective properties that cause it to catch light. This can be good if you are going out at night or even to get a finished look during the day but when the camera flash hits it, any flaws will be magnified. It is essential that your foundation match your skin tone. Some foundations with SPF can cause you to look ghostly under professional lighting. If you will wear foundation, wear a good primer under any foundation. This will help smooth out the skin and set your makeup. Be sure your mascara doesn’t flake and that anything that will touch anything with hair matches in color (i.e. eyebrow brushes need to match your brow color). Experienced, professional makeup artists can help if you desire heavier makeup. Your photographer can recommend a hair and makeup artist or have one on hand if you wish to add that service to your session. The most important feature in photographs are your eyes. Wear colors that compliment your eye color and don’t go too heavy on the eye makeup. Have your eyebrows done a few days before the session to make sure they are even and any redness has time to fade. Eyebrows frame your face and should be neat regardless of whether you prefer a bushy brow or thin brow. You may have heard the saying that the camera adds 10 pounds. That is not true, but it can show our flaws. Your professional photographer should be skilled in posing you to minimize your flaws and accentuate your strengths, but wardrobe is also important. Unless you workout regularly or are blessed with a very small frame, chances are your arms have a little jiggle in them. Sleeveless shirts and dresses can result in limitations in posing because of the way arms look in photographs. Consider wearing sleeves to cover your upper arms. See ideas for clothing on my Pinterest “What to Wear for Portrait Sessions” board. Loose fitting clothing actually makes most people look larger than they are in reality. No matter what your size, consider clothing that is more fitted, especially in your best areas. Clothing that fits properly along with good posing techniques can bring out your inner model. Solid colors bring the focus to you. Busy prints and plaids bring the focus to the clothes. Enough said. What is your style? What do you want your pictures to reflect about you? If you are fun loving consider adding props to show your personality. Simple accessories like brightly colored scarves or necklaces, head pieces (flowers, baby’s breath) or balloons and confetti can be used to show off your personality. If you have a sassy or sophisticated side, consider bringing a pair of high heels or a high fashion dress as one of your outfits. Solid, bright colors like red can add a pop of interest but avoid neon at all costs. Communication with your photographer is the key to any successful photo session. Do you like one side of your profile better than the other? Tell the photographer ahead of time. Is there something you always love or hate about yourself in pictures? We need to know that so we can take care of it. Do you have an idea for a pose, prop, or location? Let’s talk about it ahead of time. I will ask you “If I can only take one good picture today, what should it be?” Be ready to answer. I will take many more than one but knowing your answer helps me to prioritize and get exactly what you want.